Fig. 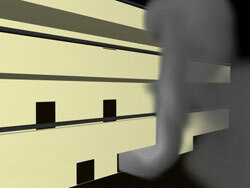 1: Simulation of the development of smoke inside a building. If a building is burning, precautions must be taken to allow people to escape safely. Hence, smoke must be guided not to block the view in the escape corridors. 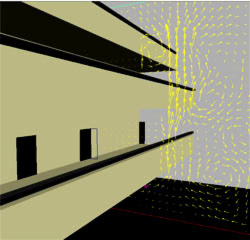 It is usually very unreliable and expensive to test a buildings behavior under fire by model experiments. A simulation can provide this information much cheaper and is more reliable. It helps to modify the building structure in an early planning stage in order to avoid hazards due to smoke. Fig. 2: Velocity vectors showing the flow of of smoke.